Many ancient traditions hold the number seven to be basic in their cosmology, for example, the idea of seven heavens arranged in a hierarchy. Your goal is to advance through them, to reach the seventh heaven where the ultimate divinity resides. In scriptural references, seven symbolizes perfect completion or a perfect whole. We’ll now look at how the number seven is connected to music in a simple, technical kind of way. Later, we will see how that number relates to music in a much different fashion. The purpose now is to reinforce the idea that seven is part of the grand design that underlies everything in creation. Athenaeus was a third-century Greek parlor intellectual, writing on many subjects. He wrote, “It is plain to me that music should also be the subject of philosophic reflection. Pythagoras of Samos, with all his great fame as a philosopher, is one of many conspicuous for having taken up music as no mere hobby; on the contrary he explains the very being of the universe as bound together by musical principles.” Pythagoras was a philosopher/mathematician, living around 500 BC, and he was probably the world’s first music theorist, unless the ancient Egyptians figured it out first and we don’t have any record of it. (Early philosophers were also scientists; there wasn’t much of a dividing line.) 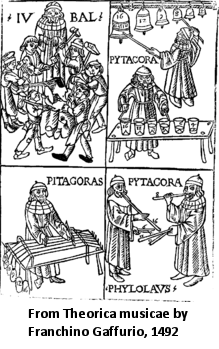 Pythagoras discovered the mathematical basis of musical intervals: that harmonic intervals are small whole number frequency ratios, such as 3:2 and 4:3. An octave is 2:1 ; the high note vibrates twice as fast as the lower note. He found that a musical scale could be constructed using seven notes, in a way that pleasing harmonies could be made from groups of those notes, and he explained how it worked mathematically. Only the seven-note scale harmonizes well with itself and has the notes more or less equally-spaced. (In an 8-note scale the eighth note is a repeat of the first note, an octave higher.) He didn’t stop there; he went on to postulate that all creation was simply constructed, logically ordered, and this scale was the basis of it. The heavenly bodies, including the planets known at the time, “sang” the notes of the scale in their orbital motions, each one a different note, and this was the unheard (by human ears) “music of the spheres”. This is happening around 500 BC or so. 1 Diogenes Laërtius, Life of Heraclides, translated by Robert Drew Hicks (1925).